In order to implement a ‘Society of Literary Scholars’ in your school, you need to focus on one very basic facet. You need to carefully choose amazing grade-level books. These books should be a combination of old titles, new titles, and different genres. These annually chosen books will be the backbone of your ‘Society.’ They will be read and shared by each and every child in your school along with all of the parents, teachers, and staff that are participating in the program. Multiple adults, grade levels, and classrooms will find a common language through the ‘Society’ stories that you have chosen for them to read. The focus is on the children, the stories, and the books. ‘A Society of Literary Scholars‘ is a school and home-based reading program. It is a method of immersing children in a culture of literacy by providing them with quality books at all times. A ‘Society’ is built around three main components that all students are exposed to and interact with throughout a school year. It is a program that can be utilized as is, or optionally, personalized and tailored to individual situations and schools. It is a sustainable and effective program that allows participants to develop and deepen their love of and for reading. It is a reading program that’s different than what you are used to. It might even be a stretch for you to imagine or sound too good to be true. Simply put, it is a ‘back to the basics‘ reading program. ‘A Society of Literary Scholars’ allows a community of parents, educators, and students to utterly align in their goal of enhancing and improving reading abilities. Above all, strive for best practice. Do what is ethically and morally right. It feels good and it works. *This is your gift to your students. 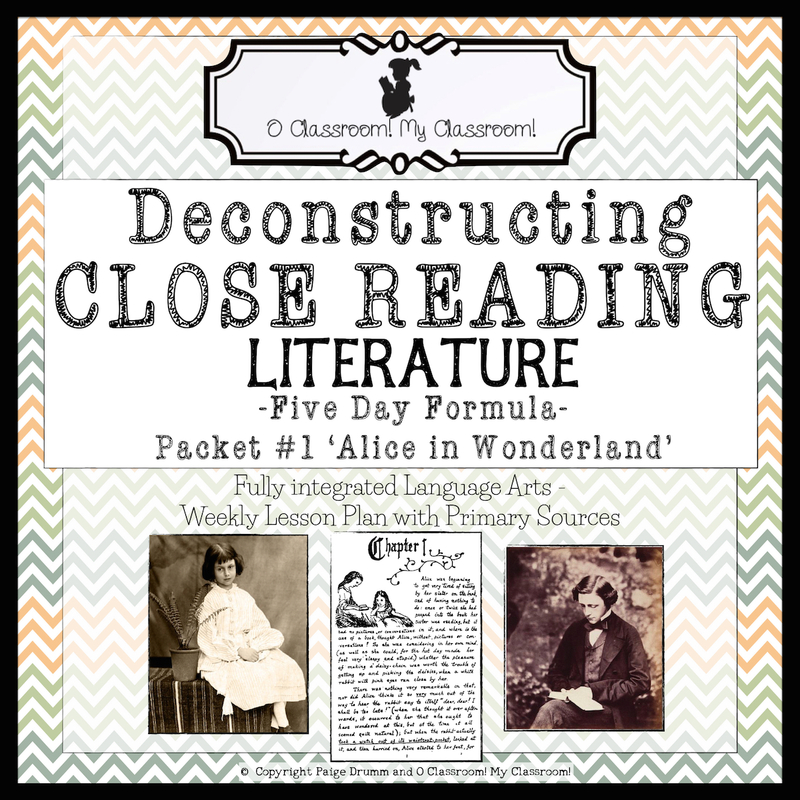 I never intended to spearhead an entire movement towards ‘Deconstructed Close Reading in the Everyday Classroom,’ but it is something that I was curious about and wanted to do for myself and my students. I hope I have conveyed through these posts that when you do something to better yourself and your teaching; you are doing something ethically and morally right. When educators stay true to their ethics students always benefit. This formula cycle is win-win for all involved. If you have any questions please let me know. I would be more than happy to answer them. I am completely serious. This is my passion; something I fully believe in and love sharing with others. Deconstructing Close Reading DISCLAIMER: We strive to get through the entire piece of text each day, but if we don’t that is okay! We do what we can do. If we get through finding main ideas for the first few paragraphs than those are what we create gists for the following day. Of course, then we use the remaining few paragraphs to infer and quote from. In this manner, we are able to delve deeply into the content regardless of our time constraints. Second, we do a lot of small group work throughout the cycle. I prefer to assign them partners/groups and place my low with lows, mid with mids, and highs with highs. They stick with their partner for the entire week, before being switched to a new partner for the next formula cycle. By doing this, students are able to work on their level with a partner who thinks in a similar way. As we regroup, share, and discuss multiple times each day students are shown different levels of thinking and can gravitate towards whatever level of thought they understand and agree with. In this manner, the entire cycle is self-differentiating for each individual child. Allowing entry points for learning across the board while still scaffolding and encouraging higher level thinking to occur. The low get what they can handle out of the process, as do the middle and the high! Day four of the formula cycle ties directly back to day one. Around half of the inferences come directly from the student’s text-based questions that were asked on day one! We refer back to our annotations and as whole or small groups go paragraph-by-paragraph looking for good questions that we can infer the answers to. Some questions lend themselves well to this process, others not so much. Just make sure to pay close attention (and take notes yourself) on what questions are asked during cycle day one and what conversations follow. Once students have discovered a solid question, we discuss the inference and the record it on note taking paper. We write the paragraph number, then our inference. Directly following our inference we record our supporting quote. The supporting piece of evidence, or quote, is easy to find with the guiding questions. We simply take what was circled (the questions inspiration) and record it as a direct quote. Of course, this day of the cycle follows the same routine as the previous days. With upper grades I model the first paragraph, we work the second one together and the students work in small groups for the rest. Lower grades complete the process through interactive shared writings as a whole group, while individually recording their inferences and quotes on their own note taking paper. As usual, we regroup after each paragraph to share our inferences and evidence, compare our work, receive feedback from one another and alter our ideas if needed. At this point in the Deconstructing Close Reading cycle, teachers and students can choose to integrate their close reading knowledge, annotations, and notes into writing content. I personally prepare a persuasive and additional, informative prompt for every close reading piece of text that my students work on. We follow a wonderful writing scaffold and I encourage my students to include a paraphrase, quote, and inference in each paragraph of their essays. By providing a prompt directly related to the text they have been, or are working on, students are easily able to integrate all of their knowledge into their writing responses. The entire formula cycle automatically helps students to identify and compose their thoughts in solid preparation for responding to a corresponding writing prompt. Whether days, weeks or months in the future, the scaffolding for their writing is already within their deconstructed close reading work and can easily be revisited. So, if you don’t have time to prepare a prompt or complete an essay each week with your students, save their articles and notes, staple them together, and then pull them out later when there is more time. 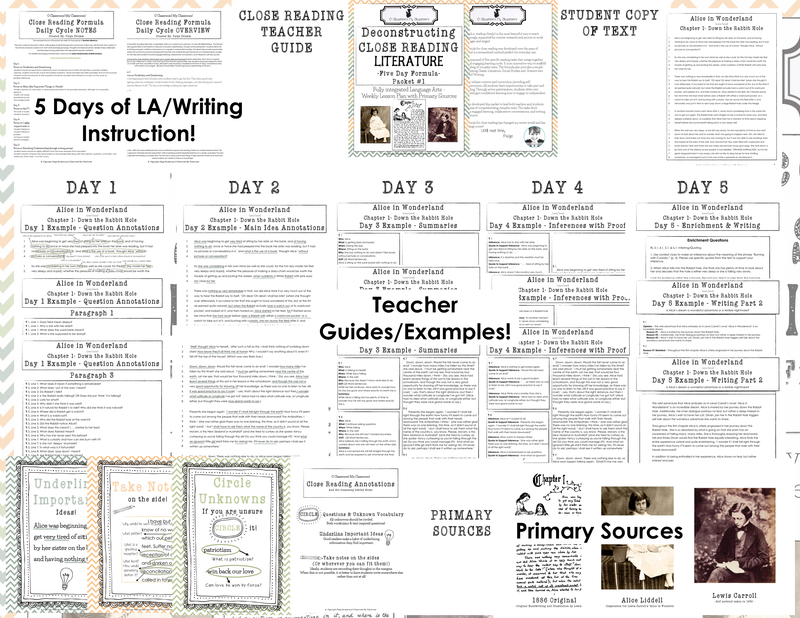 Teacher Prep: To prepare for day three I take the main ideas that I have previously identified for each paragraph and turn them into a twenty-word summary or gist. In the spirit of full disclosure, I have to admit that I haven’t actually done this aspect of preparation work in years! I am confident in this formula and know that the students will create something marvelous on their own and my effort to prepare for this isn’t really needed. Then again, if you are nervous and feel like allowing this process to be student driven is a stretch for you feel free to build your own confidence in the process by preparing a twenty-word gist for each paragraph ahead of time! Remember that your work will not be shared with the students, unless you throw out a small piece of one here or there just to help them get unstuck. The only other thing that needs to be done on day three is to provide the students with a few pieces of paper! Day three of the formula also begins with a quick read to get the flow of the chosen text. Next, on a scratch piece of paper, or white boards, we record all of the words we have identified from paragraph one as main ideas. We fiddle with the words and mix them up here or there and attempt to compose a twenty-word sentence that captures the essence or gist of the paragraph. I always tell the students to mush all of the words together and create a sentence. Then they need to count the words within the sentence and give themselves a starting point. Sometimes they need to add a few words; other times they need to take some away. The key is to keep the main idea pure! Making sure all of the thoughts underlined are somehow included in the gist, even if they are not included verbatim. The students love this process and adore the link between taking what they have identified and creating a paraphrase. It is magical for them to see that an idea found within multiple sentences can be fully captured in only one. It is a powerful process and builds their comprehension, grammar, summarizing, and confidence. Yes! I do this with grades as low as first. Granted, I typically act as scribes as we share write a twenty-word gist for each paragraph together. Identical to the first two days, with upper grades I model the first paragraph, scaffold the second and have them work in small groups for the rest. In lower grades, we often share write and work as a whole group. But, we ALWAYS individually record our work and regroup after each paragraph to share our sentences, compare our sentences, and alter our sentences if needed. Imagine reading fifteen different twenty-word sentences that all have the exact same message. It is not only engaging but is seriously amazing! Teacher Prep: To prepare for day two I make sure that I have gone through the article myself and identified the details vs. the main ideas for each paragraph. Please let me strongly reiterate that I rarely end up using my notes and only refer to them if the students need a little bit of additional guidance here or there. Day two of each formula cycle begins in the same manner as day one, with a quick read to get the flow of the chosen text. We then jump right into paragraph one going line by line identifying whether each thought is a supporting detail or main idea. We truly focus on what each paragraph is about. We ask ourselves, what is the purpose of this paragraph? What was the author really trying to tell us? The diamond of ‘a main’ idea is hidden among piles of coal details. In the beginning, students aren’t very good at this. Specifically, when working with an authentic primary source, complex article, or piece of classic literature. That is okay! They improve with practice and quickly become skilled at determining what matters within each paragraph. One more thing I think it is important to point out is that the students are not always underlining entire sentences. They are often choosing a word or phrase here or there. Throughout this aspect of the formula, we follow the same scaffolding as day one. With upper grades, I model the first paragraph, scaffold the second paragraph by working with the students, and then for the additional paragraphs allow them to work in small groups. For lower grades, I tend to go paragraph by paragraph and we determine the main ideas interactively. Each paragraph gets between 3-8 minutes to be worked on before we regroup for sharing, discussion and discourse for an additional 10-15 minutes. Regardless, of whether the students are in upper or lower grades they are in charge of handling and annotating their copy of the text. As we meet together and share our main ideas, we may agree to disagree, but we also strive to convince one another of what matters and which main ideas are truly main ideas. Within a few months, the students are able to quickly identify the main ideas independently and are typically in agreement when comparing thoughts as a group. As with day one, students are encouraged to alter their choice of the main idea for each paragraph if they feel so inclined. On occasion, the students come into the group discussion certain that their main idea is solid, but then quickly decide to take out a word or phrase when peers convince them they are unnecessary. Don’t forget the annotations are alive and should be altered as the students and their learning evolve. With upper grades, I traditionally model the first paragraph for the students, scaffold the second paragraph by working with the students, and then for the additional paragraphs allow them to work in small groups. For lower grades, I tend to go paragraph by paragraph with them acting helping them to literally ‘read’ the text, while they identify their vocabulary concerns and textual unknowns. Granted, even in first grade, the students are still handling their copy of the text, circling their and recording both their unknowns and the unknowns of others. The ultimate key regardless of grade level is that after each paragraph we regroup as a whole for discussion and discourse. We share our questions, delve into the context for possible clues and answers and then discuss additional inferences we can make in direct relation to their questions. Students are not only allowed, but also encouraged to record one another’s questions and relating inferences. Their text becomes a living document that changes throughout not only each day of the cycle but also each conversation held throughout the process. You will notice that students ask questions that are appropriate to their developmental level and are interesting to them. From this first instance with the text students begin to own their learning. They are in charge of the questions they ask and the answers that may follow. My high students ask much more abstract and indirect questions while my lower students tend to stick to the literal. That is okay, it is a big mesh pot of what they each need to know and discover in order to make sense of the text. By sharing our questions with one another and discussing possible answers we are scaffolding learning for all in the classroom and allowing students to completely guide this aspect of the deconstructed formula cycle. This aspect of the cycle can easily take anywhere from 1-3 hours. If it is an extremely rich text the students may not get all way through each paragraph and that is okay. We do what we can do within our time constraints. Teacher Prep: To prepare for day one I make sure the text is copied and students have a pencil. I also make sure I have read the text myself and pr eviously identified any vocabulary words students may struggle with, along with textual/content questions they may have. I rarely end up having to refer to my notes, and typically prepare them simply as a map in case I find the students need a bit of prodding. Day one of each formula cycle begins with a quick read to get the flow of the chosen text. This is hard for teachers to handle because we want to provide background information, help make connections and define the vocabulary that is complex. You CANNOT do that during this part of the formula cycle. (If you falter and begin to explain the text you are driving the learning and you really want to focus on the students taking the learning where it needs to go.) I like to either have the students skim straight through the article, or I read it aloud while they follow along. I usually get through 1-2 pages of text read aloud to get the flow, within three minutes on this first day of the cycle.